I woke up singing that this morning! We’d pretty much decided that we were going to get the earlier train into Lincoln. It meant an earlier start, but it was match day! The time of year helped us along the way with early morning sunshine. We were at the station by 7.50 and although bright, it was chilly. There’s something about a city before the rest of the world wakes up and Lincoln didn’t disappoint this morning- the early morning chill kept a light layer of fog upon us which added to the whole anticipation. 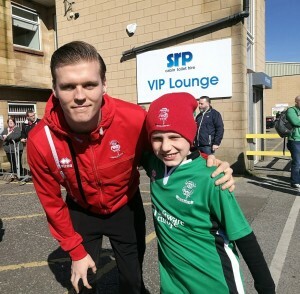 James and I were in out Imps hats and we’d not even left the station before someone asked us who was playing and wished us good luck! As last week, we went to Wetherspoons for breakfast- a few Imps in there already- and we enjoyed a leisurely meal and a few welcome cups of coffee. 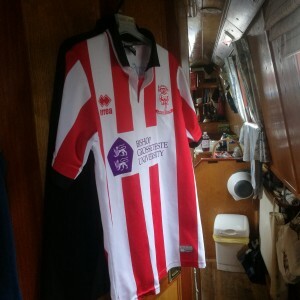 By 10am we were fed & watered and heading on down to Sincil Bank to collect the tickets and go to the Club Shop. As it always seems to be the case when we leave plenty of time for queues- there are none! We’d picked up the tickets and got James shirt in no time at all! The same as last week, I was dead excited to see our tickets and this week we were in Block 5…The noisy section! 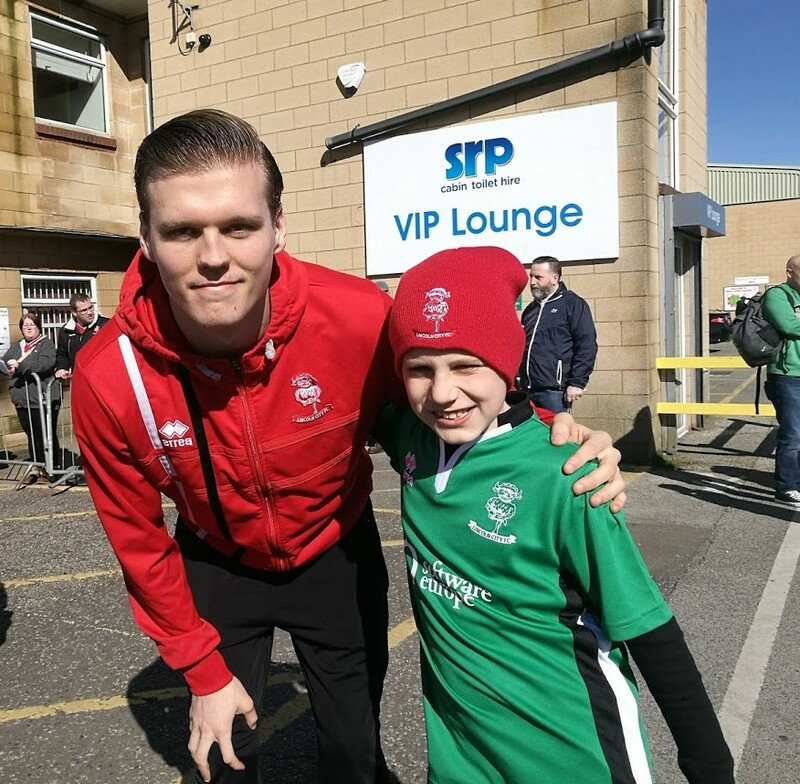 By being early, we were also in time to see the players arriving and James got a signature and a picture with Sean Raggett- One happy Imp! (Mental note- next time, bring a sharpie!). Once the players were all in and there were no more photo or autograph opportunities, we decided to take advantage of the spring sunshine and sit on the wall. The great thing about being an Imp, especially outside Sincil Bank, is that you can start random chats with people- all with a common interest. Today was a great day for chit chats and we passed a pleasant 10 minutes or so. We like to be in the ground earlier- we enjoy the atmosphere and James likes to see the players warming up. Not only were we block 5, but we were second row from the front, so a very close view and it meant that we were nearer James when he went closer to the pitch. Once the game started, the atmosphere of block 7 didn’t disappoint! I always say that since I started going to matches, it’s he only pace that I can be noisy and don’t get scowled at. Today was no exception, so you can imagine the rest- we spent the next 90 minutes cheering, clapping and singing our team to a 2-1 victory over Forest Green Rovers. What a great game! What a great day.